SAN FRANCISCO, CA--(Marketwired - Jun 1, 2016) - STRV, the leading mobile app development company, today announced the winner of its Pitch & Win Contest. The startup pitch contest invited participants to explain their startup concepts for a chance to win first prize of $150,000 in mobile application design and development resources. That equates to three STRV engineers and designers working for three months, free of charge. Out of hundreds of startups that applied, 15 of the most promising were selected to pitch in front of a panel of judges. Last Tuesday May 24, a group of 100 industry insiders gathered in San Francisco to network, watch the pitch presentations, and hear the judges' feedback. The panel consisted of five judges: Julio Vasconcellos (Entrepreneur in Residence, Benchmark), Jennifer Hopp (Investor, Advisor and Entrepreneur), Arjun Arora (Entrepreneur in Residence, 500 Startups), Lubo Smid (Co-founder, STRV), Kemar Newell (Founder of Flip, Y Combinator Alumnus). "We are very excited that we won the pitch competition because there were a lot of great companies pitching. We are familiar with the excellent work STRV produces and we are thrilled to have them working with our engineers, helping to bring the Win-Win app to fruition," said Mike Tauiliili Brown, Win-Win founder and former NFL linebacker. "We know that with STRV on our team, we will bring the highest quality apps to the market." "We received hundreds of amazing entrants to our contest from Silicon Valley's top incubators and accelerators, making it very tough to narrow the group down to just 15," said STRV founder and CEO David Semerad. "Win-Win emerged the victorious, and we are excited to help them build their product, from start to finish, over the next three months." 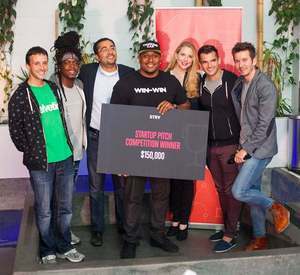 Startup Win-Win allows users to join a tournament hosted by a professional athlete and compete against their friends. Donation fees go to the athlete's charity of choice and winners will get celebrity experiences, like dinner with the athletes themselves. STRV is a one-stop mobile app development shop working with top-tier startups from Y Combinator and 500Startups, among others. Since 2004 STRV has developed hundreds of mobile apps for iOS and Android. With 150+ rock star developers and designers on staff and four offices in the US and Europe, STRV is the preferred partner of dozens of startups which benefit from our high-quality code, sleek designs, and super-fast turnaround.